Bullet VPN is an Estonia-based provider with 52 servers in 30 countries. It offers a slew of protocols, unlimited bandwidth, three simultaneous connections, Smart DNS, cross-platform client and a fantastic 30-day full money-back guarantee. 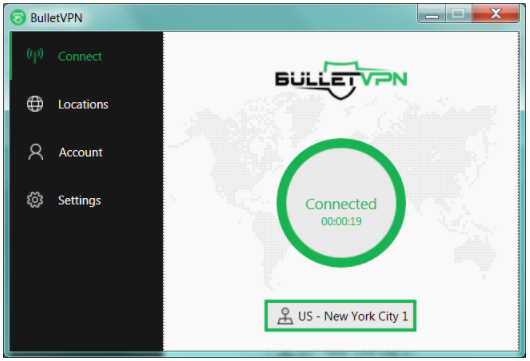 Bullet VPN kicks in at $10.98 if billed monthly, $89.98 annually, or $54.98 every six months. Regardless of the plan, you get a robust encryption, unlimited serves switches, five different protocols, and unlimited bandwidth topped with a Smart DNS. You can pay via PayPal, credit cards, Bitcoin or wire transfer, prepaid cards, and e-Wallets. There is no free trial, but the money-back guarantee is permissive enough to get a one-month subscription and try the whole package. Be warned that you’d need to justify your request for a refund (for feedback, the refund is no-questions-asked), although ToS says nothing about justifying. This is just something that I encountered with my refund request. Bullet VPN has a neat member’s area layout, with an intuitive placement of all important things – servers, tickets, invoices, support (including live chat), affiliates, downloads, and whatnot. You can fill in your user details with information about your address and payment method, but if you want to protect your privacy, you can just ignore that section. The same dashboard also lists your account activity – number of logins, total usage, download and upload, usage limit, status and accumulated hours online. I don’t know if it’s good or bad. Even though it’s detailed insight into your usage history, it’s also logging, which is something frowned upon in the VPN industry. On a side note, the provider puts it there in your face, so you know what kind of information they have on you. Bullet VPN supports Windows, Mac, Android, iOS, and a plethora of other platforms such as Apple TV, Roku, Smart TV, PS4, Xbox One and Xbox 360 and more. There are also dedicated VPN apps for Android TV, Nvidia Shield TV, Amazon FireTV, and FireStick. Setup guides and a knowledge base are readily available, but the installation and launch shouldn’t take long. 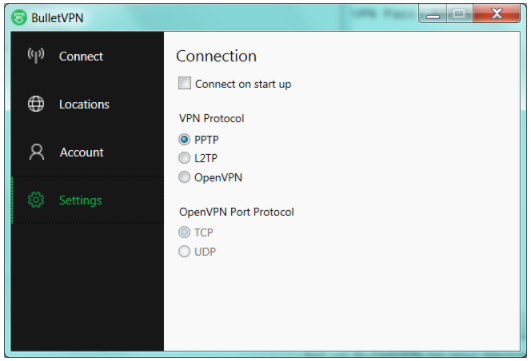 Bullet VPN Windows client is a neat and sleek app with spartan settings and self-explanatory buttons. 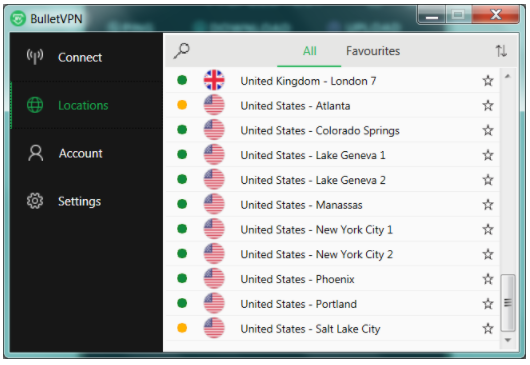 You will have no difficulty finding the servers list, starring your favorites, or sorting them by name or server load. 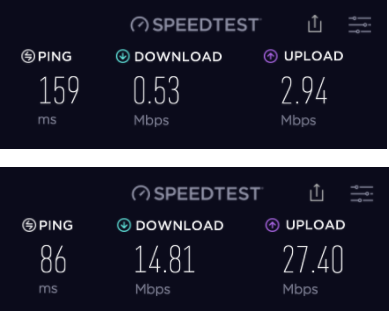 The performance was consistent; the client didn’t freeze or disconnect. That said, their support is only available via the ticketing system, but they’re reasonably prompt. Bullet VPN Windows client lets you choose from PPTP, L2TP, and OpenVPN protocols, with the latter offering TCP and UDP. You can also set the client to launch on device boot, but that’s about all tweaks you can have here. If you’re a seasoned VPN veteran, you might as well opt for config files for your OpenVPN client. Bullet allows P2P file-sharing and streaming a wide range of geo-restricted services – all without capping your bandwidth. You can have up to three simultaneous connections per account. Considering Bullet is not cheap, three connections seem too tight if you ask me. Bullet VPN seems particularly proud of its streaming capacity. The provider even maintains a list of streaming services it unblocks and frankly speaking, I was happy to finally see a VPN that admits it doesn’t unblock Netflix US. In most cases, providers just keep advertising Netflix US as a click-bait only to land you a disappointingly poor experience. 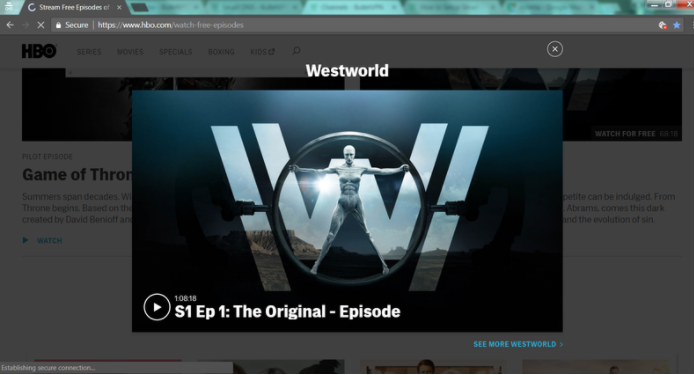 Bullet VPN works to bypass geo-blocks for Amazon Prime, CBS, HBO GO and HBO Now, Hulu, Pandora, and a slew of other US and European channels. 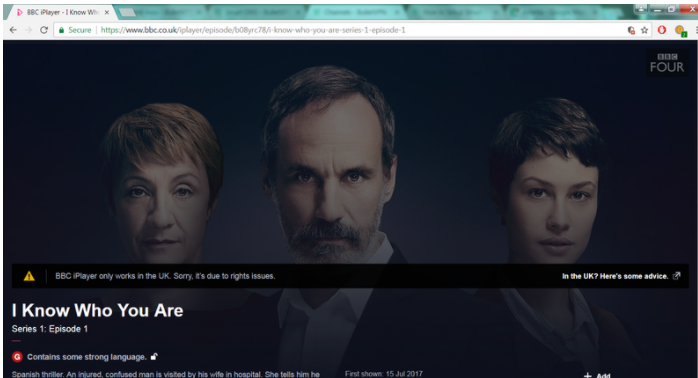 At the same time, my experience with BBC iPlayer was surprisingly poor. Bullet VPN offers seven UK servers, all of which showed Belgian DNS. Whether it’s the Belgian DNS, or something else, but BBC iPlayer would keep recognizing I was accessing it from outside the UK. I tried all seven servers and managed to access BBC iPlayer the second time I connected to the seventh server. What gives. On the security front, Bullet delivers a selection of protocols but doesn’t do much to explain the encryption used here. It supports OpenVPN, but that’s all you can find on the inner workings of the VPN. I’d like to see that addressed. ToS finally gets down to your VPN usage. While the provider does not log your activity (sites you visit, emails, DNS lookups), it does log access to their servers for troubleshooting. They presumably do not filter or censor what you do online, and do not hand in your data to anyone unless law enforcement comes in with a court order. Considering they’re in Estonia, it’s highly unlikely. Overall, I found nothing overly suspicious about Bullet VPN’s treatment of user data. The level of transparency is welcome, and the fairly basic session logs can’t hurt much if you are an average user looking to stream your favorite TV shows. Bullet VPN is expensive, but if you’re a heavy streamer or torrenter, it might be a feasible proposition. It could use a little more consistency in unblocking BBC iPlayer, and the speeds aren’t always stellar. But the provider is transparent and offers good privacy and security specs. It’s also very easy to use and cross-platform, so beginners will appreciate the simplicity. 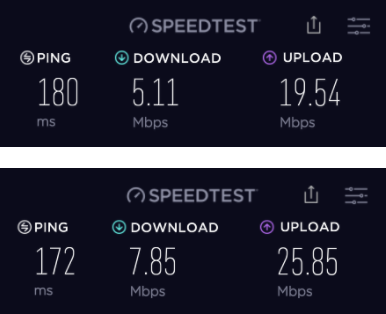 I’d love to see the speeds improve. Other than that, it’s a promising provider. Try it.